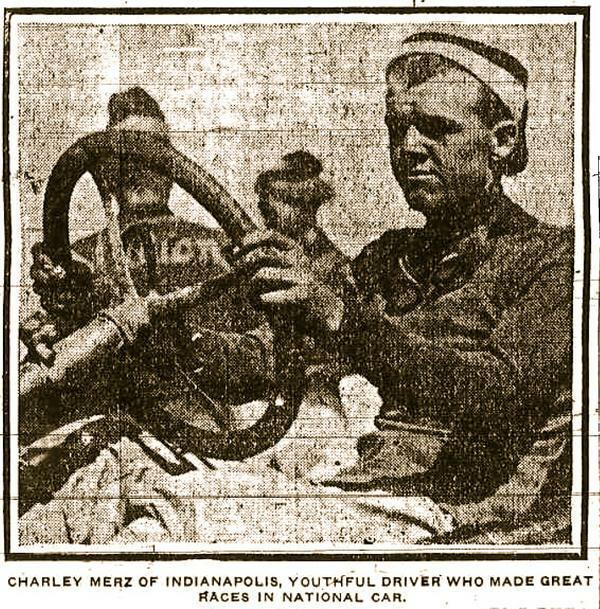 This image of National Motor Vehicle Company driver Charlie Merz originally appeared in the August 21, 1909, Indianapolis Star. 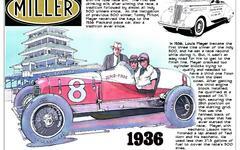 It was part of the coverage of the first auto races at the Indianapolis Motor Speedway. Merz was photographed because of his victory in a 10-mile sprint race on the second day of the three-day race meet. The 10-mile sprint race gave Merz a genuine Indianapolis Motor Speedway victory. Charlie Merz was an impressive player in auto racing's early days. At just 17 he and co-driver "Jap" Clemens set a new 24-hour world speed record in November 1905 at the Indiana State Fairgrounds driving a National Motor Vehicle Company stock car. Four years later he survived a brutal accident at the Indianapolis Motor Speedway's first auto race on August 21, 1909. Again driving for National, a tire blew and he crashed through a wood and wire fence approaching the southwest turn. His riding mechanic, Claude Kellum, and two spectators, James West and Homer Jolliff, perished in the disaster. Somehow, Merz survived largely unscathed, despite the giant machine turning over on him. He competed in four Indy 500's, finishing in the top 10 three times. Most spectacular was his third-place finish in 1913 when his car burst into flames just before his final lap and instead of stopping, he forged ahead for the final lap with riding mechanic Harry Martin swatting the flames back with his jacket. Merz was a successful businessman as well, founding Merz Engineering, a company that prospered well beyond his death in 1952. He also served as chief steward of the Indianapolis 500 from 1935 through 1939. If you want to read more about Charlie Merz, check out my Wikipedia entry.